Everyone has different needs on holiday and these rules enable everyone to enjoy the site equally. Pets must be kept on lead at all times and please clean up after them, dogs are not allowed inside the cabin or bell tents except for assistance dogs. Do not litter the campsite, please use bins provided. The noise restriction applies from 23.00-07.30. This means no music, stereos, musical instruments, shouting, singing, or any significant noise that disturbs the stay of others. You will be given 3 warnings over the course of your stay, then you and your party will be asked to leave immediately. Any behaviour that the management deems to be anti-social, disruptive, or abusive towards staff or other guests on the site will not be tolerated. It is important for our guests to work in harmony with other guests and our staff by observing and respecting each other’s privacy, right to peace and our other campsite rules. Maintaining high standards on our site is of paramount importance and fundamental to our policy. Anyone not observing and respecting these guidelines will be asked to leave. Only wood purchased at Swanns Bridge Farm can be used on site. 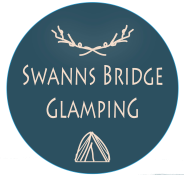 ALL PERSONS STAYING ON, OR VISITING THE CAMPSITE USE THE FACILITIES PROVIDED ENTIRELY AT THEIR OWN RISK, SWANNS BRIDGE GLAMPING CANNOT ACCEPT ANY LIABILITY FOR LOSS, DAMAGE OR INJURY TO PERSONS OR PROPERTY CAUSED WHILST ON ITS PREMISES OTHER THAN ITS STRICT LEGAL LIABILITY.